But of all the dive watches ever created, there is one that holds the title of heavyweight champion of cool amid this vast pantheon of ticking demigods. That watch is the Rolex Sea-Dweller. And it has defined its coolness not through military might, but like Mohandas Gandhi, by demonstrating its inner depth. The Sea-Dweller went deep, literally — like Schopenhauer and Goethe deep. By submerging further than any watch that had come before, it redefined the performance abilities of the commercial dive watch so radically that to say that it was ahead of its field is to do it a disservice. The Rolex Sea-Dweller was and has always been in a field all of its own. Interestingly, its iconography, in particular the introduction of the first helium escape valve ever fitted to a civilian timepiece, was related to fields of a different kind; to wit, the oil fields lurking beneath the ocean. 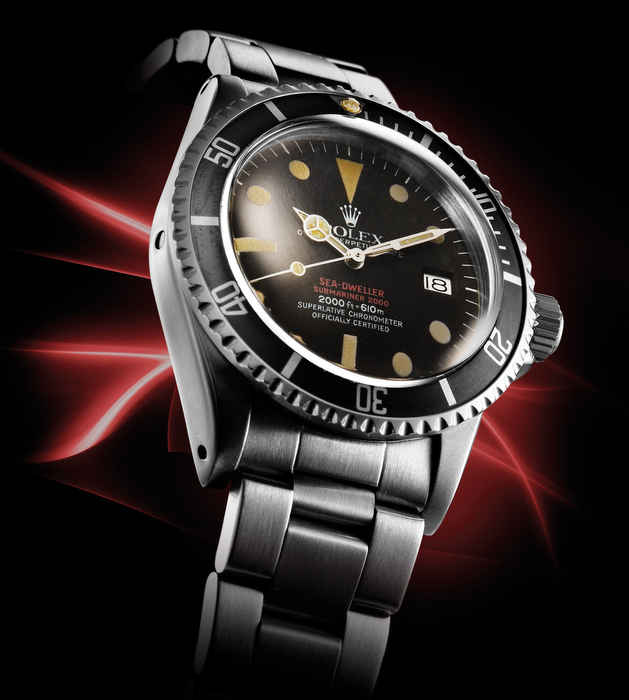 Rolex’s iconic Submariner ref. 6200, the world’s first commercially produced dive watch, was released in 1954. 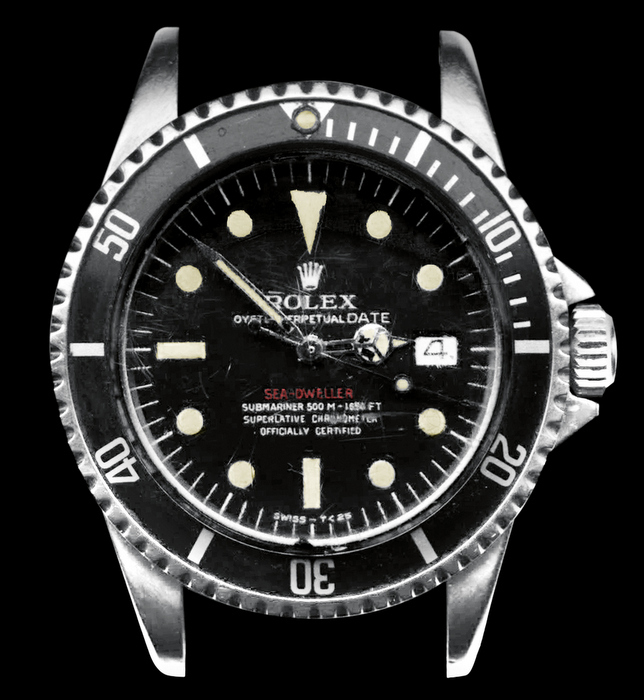 But by the 1960s, the belief was that Rolex had begun experiments with a deep saturation dive commercial watch with the explicit goal to submerge to the heretofore unrealised depth of up to 2,000 feet or 610 metres. At the time, the Submariner ref. 5513 was rated to 660 feet or 200 metres. So, the idea of tripling this depth rating was an ambitious one. Early experiments involved watches with a new model designation, ref. 1665, and the words ‘Sea-Dweller’ on the dial. Some of these watches did not feature the helium escape valve (it is believed 30 such watches were created), though many of them failed during saturation dive testing. 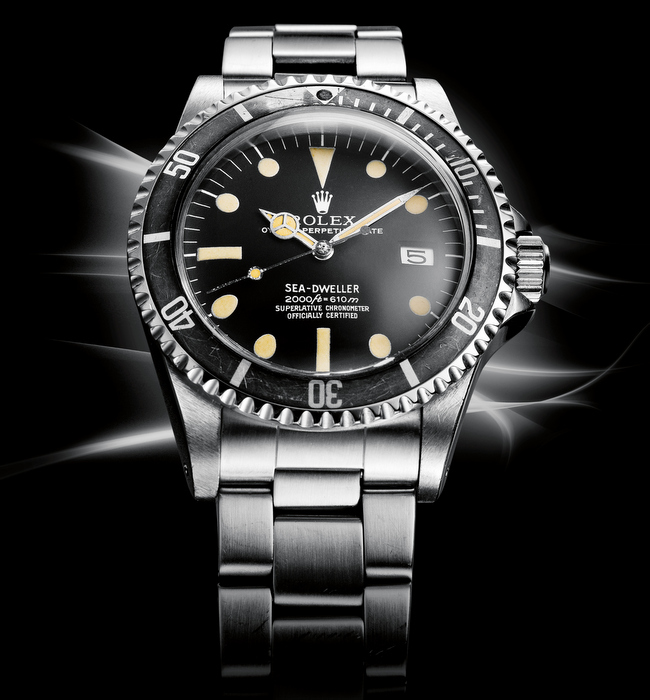 The Rolex Comex Submariner ref. 5514 was made for the industrial deep-sea diving company and not released to the general public. Indeed, field tests demonstrated the absolute necessity for the helium escape valve created by Rolex in partnership with the French industrial deep-sea diving company Comex. Comex had pioneered a method of saturation diving where divers breathed a mixture of hydrogen, helium and oxygen, allowing them to work at great depths for a long period of time. After each session, the divers would return to a pressurised chamber that would be maintained at the same pressure as their work environment. That way, they only had go through the very lengthy decompression process once at the end of their entire dive schedule. While inside the chamber, they would breathe the same hydrogen-helium-oxygen mix. According to Rolex expert James Dowling, small molecules of helium are able to force their way past the watch seals into the watch, so the pressure inside the watch would equalise with that of the chamber. But during decompression, the pressure in the chamber would diminish at a faster rate than the pressure inside the watch, and this imbalance would often cause the watch crystal to be forced out at high speed. Rolex got around this problem with the world’s first helium release valve, which would allow trapped helium molecules in the watch to escape. The helium release valve was first used on standard ref. 5513 submariners refitted with the valve and dubbed the ref. 5514. 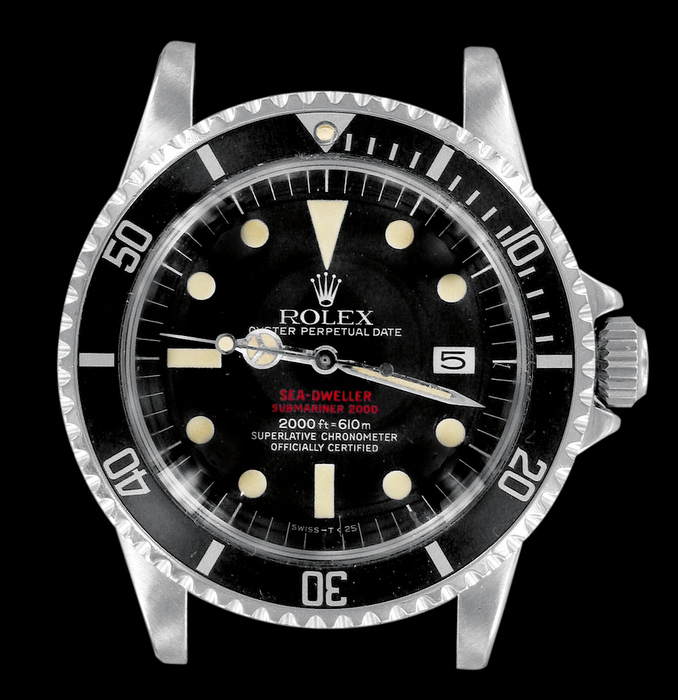 These watches were made exclusively for Comex and not released to the public, though it is believed several watches were sent to dealers around the world as part of Rolex’s communication campaign. You may ask yourself why in the first place Rolex felt compelled to offer a watch equipped for the rigours of the decompression chamber to civilians? It would seem that it was to reinforce their pioneering status in the field of deep-sea exploration. Since time immemorial, the sea has been filled with foreboding and mystery. Amazingly, in 1961, when Russian cosmonaut Yuri Gagarin orbited at an altitude of no less than 350 kilometres above earth, man had yet to explore more than 70 metres beneath the ocean’s surface. During the ’60s, a boom in deep-sea exploration for the offshore oil industry compelled man into the abyss. But while this may explain the motivation behind the creation of the first Comex ref. 5514 watches equipped with helium escape valves being worn by industrial divers, it doesn’t quite explain why Rolex decided to release a commercial watch with the same crazy deep-descent capabilities and a valve that no civilian would ever need to use. 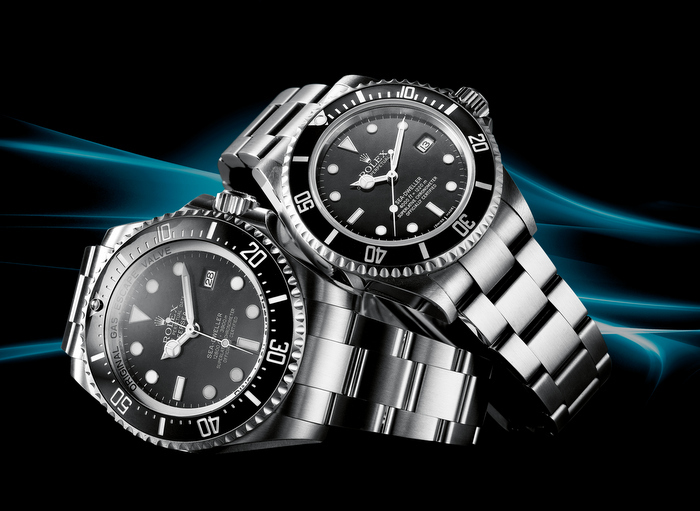 Was the creation of the Sea-Dweller like the Spinal Tap speakers that ‘go to 11’, an act of technological excess linked to human hubris, or was it more of Rolex’s statement of its undeniable conquest of the sea? An examination of the current events of the era might provide the best answer. During NASA’s Project Mercury, the Omega Speedmaster had been selected as the official watch to accompany these astronauts into space. From a communication perspective, it made immense sense for Rolex to make a far-reaching declaration of its total mastery of the other great blue yonder. The impetus to push the Sea-Dweller into the market with some urgency could account for the two different types of cases: an earlier thin case — very similar to the Submariner case retrofitted with the helium escape valve used in the Comex ref. 5514 — and later, the thicker case made exclusively for the Sea-Dweller range. The early ref. 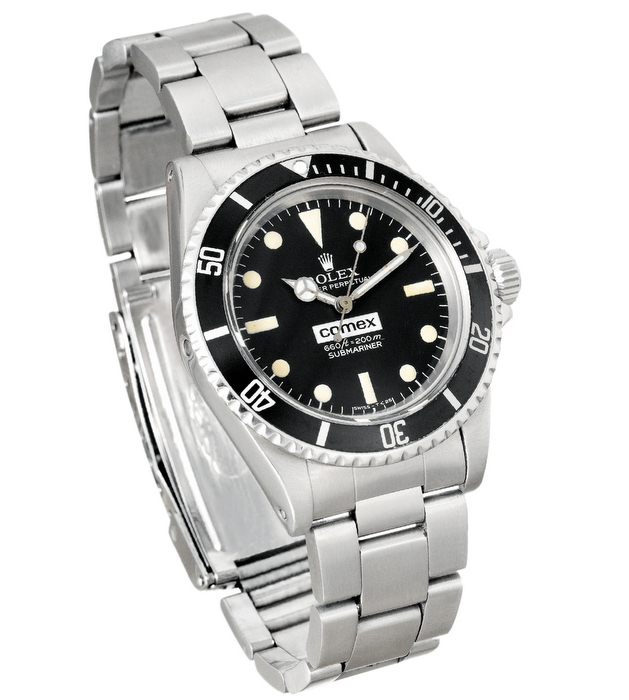 1665 Sea-Dwellers were released in 1967 in very limited series. While there are no official figures, it is generally believed that just slightly over 100 of these watches were made. They are also distinct from the later regular-production ‘Double Red Sea-Dwellers’ made from 1971 to 1977, and ‘non-Double Red Sea-Dwellers’ that followed from 1977 until 2009 — in that their casebacks were engraved with the words ‘patent pending’. Rolex had filed for but had not yet received the patent on the helium release valve. These watches also featured a prominent Rolex crown engraved on the caseback. These ‘Mark I’ (so named by collectors) patent-pending Sea-Dwellers featured the words ‘Sea-Dweller’ and ‘Submariner 2000’ on two separate lines. Both of these lines were printed in red, hence the nickname ‘Double Red Sea-Dweller’. Because of the way the red paint reacted with the underlying white paint, the two ‘red’ lines in these watches have all faded to a light pink today. Incidentally, there was also, from this period, a particularly rare ‘Single Red’ version that featured the words ‘Sea-Dweller’ in red and differs from all other Sea-Dwellers in that its depth rating is 1,650 feet or 500 metres. One theory is that the shallower depth rating infers that these watches may have been experimental models that preceded the first ‘Mark I Double Red Sea-Dwellers’. This is further bolstered by casebacks that do not feature the Rolex crown, but have the words ‘patent pending’ on the outer flange of the caseback. The belief is that these watches were not sold to the public, but distributed to professional divers to provide feedback to Rolex. This rare example of the Rolex Mark ll Double Red Sea-Dweller showcases a distinctive Rolex coronet that some have coined the ‘smudge crown’. The unique chocolate-coloured dial was a result of the lacquer used in the timepiece’s dial reacting to UV light. 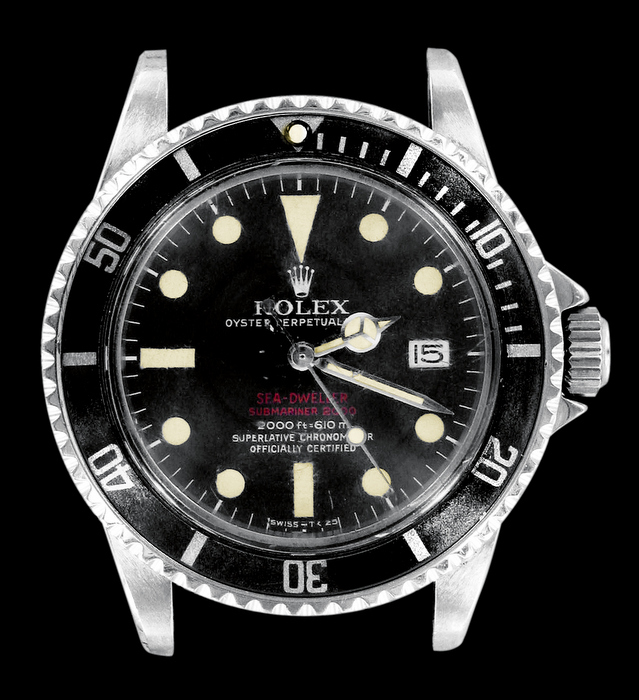 The ‘Mark II Double Red Sea-Dwellers’ went on sale in 1968 with the caseback now marked ‘Rolex Patent Oyster Gas Escape Valve’, as the helium escape valve had by then been successfully patented. Many of these watches still featured the early thin case. 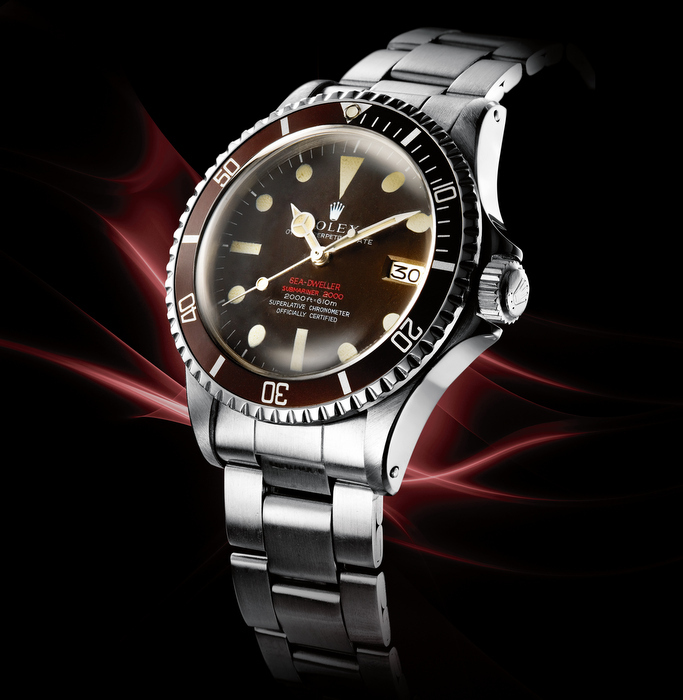 These Mark II Double Red Sea-Dweller featured two lines of red writing. They are made distinct by a Rolex coronet known as the ‘smudge crown’, which, as the name implies, looks rather globular and poorly defined. Because the lacquer used on the watch dials often reacted with UV light which made the black dial turn chocolate in color over time, many of these watches are referred to as ‘chocolate-dial Mark II Double Red Sea-Dwellers’ and it is examples with this distinct chocolate color that fetch the most at auctions after the ‘patent-pending’ models. Another telltale sign of the Mark II dial is that the ‘D’ and ‘W’ in ‘Dweller’ are touching, and the ‘L’ in ‘Rolex’ is aligned dead center with the crown. The ‘Mark III Double Red Sea-Dweller’ is believed to have been made in even smaller quantities than the Mark II and features an extremely thin coronet, two rows of red writing and a ‘Rolex Patent’ caseback. The sharper and more legibly spaced fonts of the Mark III make it a highly appealing watch. The most recognisable trait of the Mark III dial is a sleek Rolex coronet at 12 o’clock with first and last spikes that roughly align with the first- and 59th-minute hash marks. By this point, Rolex had moved to a thicker proprietary case design for the Sea-Dweller. The refined writing on this Rolex Mark III Double Red Sea-Dweller, coupled with the revised, sleek Rolex coronet on its dial, make it a highly sought-after edition of the diving watch line. The Mark I through III Double Red Sea-Dwellers collectively comprise the most collectible of the non-Comex Sea-Dwellers, and uncovering a ‘patent-pending’ model in one’s family possessions is the equivalent of finding an unmolested 1957 Porsche 356 Speedster in your uncle’s garage. The regular production run of Double Red Sea-Dwellers began in 1971 and lasted through 1977. These watches have what is known as a Mark IV dial, which has red print for the words ‘Sea-Dweller’ and ‘Submariner 2000’ in vibrant but not heavy text that appears pixelated when magnified. The Rolex crown is well defined, slender in font, but with wider-spread spikes, and its first and last spikes are aligned with the second- and 58th-minute hash marks respectively. One thing to stress when buying a vintage Rolex Sea-Dweller, in particular a Mark I–III Double Red, is that much of the watch’s value is in the dial, and as such, you should scrutinise it carefully before purchase. You should also be very careful when any servicing is performed. My own thin-case Mark II Double Red had its dial damaged during servicing, irreparably affecting its value. Overcome by grief, I eventually sold it at a significant loss. away from the red lettering on its Sea-Dweller dials that led to the eventual creation of the ref. 16660 Sea-Dweller. In 1977, Rolex did away with the ‘Double Red’ dials and produced the ref. 1665 with all-white writing. These watches are known in collector lore as the ‘Great White’. Several dial versions of this exist, including the fashionable ‘rail dial’ version, and values for these watches have in recent years begun to rise significantly, by virtue of the relatively short period of time that they were produced. By this time, the words ‘Submariner 2000’ were dropped to provide greater product differentiation between the Submariner and the Sea-Dweller. The range was replaced in 2008 by the Rolex Deepsea (pictured with the author’s own Sea-Dweller). By 1978, Rolex introduced the ref. 16660 Sea-Dweller fitted with a sapphire crystal, a bigger helium release valve and an upgraded depth rating to 4,000 feet or 1,220 metres. 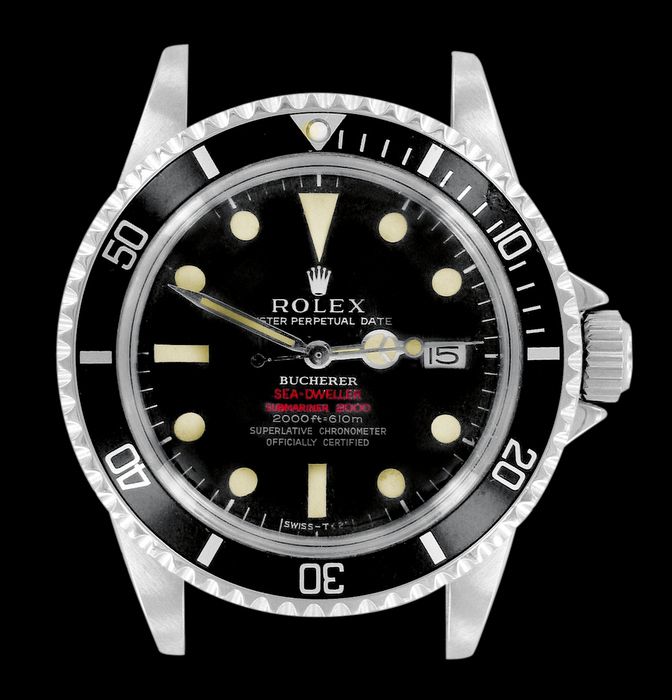 While all previous Sea-Dwellers featured Rolex’s caliber 1575, the ref. 16660 introduced the caliber 3035. The most significant change represented by this movement was the increase of vibrational speed from 19,800vph to 28,800vph, endowing the movement with far greater autonomy from shocks. This is the longest-running manifestation of the Sea-Dweller and has remained essentially unchanged for more than three decades. Sadly, in 2008, Rolex announced the end of an era when it replaced the Sea-Dweller with the Rolex Deepsea, a watch with a frankly stupendous and never-before-realised depth rating to 12,000 feet or 3,900 metres. This is made possible by a three-piece case architecture featuring a middle section fabricated from nitrogen-alloyed stainless steel and rendering a timepiece capable of withstanding “pressure that would crush a sub”. So, why would Rolex create such a watch when the fact is that the wettest most dive watch owners will get is when they down their fourth martini? In keeping with the original spirit in which the legendary Sea-Dweller was created, because they can.